The old places are still there, Scholes' (now Baldwin - pictured left), Hamiltons', Sprouses' (now Cochran) high up along the eastern shore. Wide wicker strewn verandas overlooking lawns that sweep down to the lake. They go back over a hundred summers; croquet, pitchers of lemonade, ladies in billowing white and wide picture hats, men in white ducks and boaters, kids in sailor outfits and everyone in those itchy black wool bathing suits. At the docks were the gleaming, varnished Chris Crafts and Gar Woods. And indeed there were sailboats. 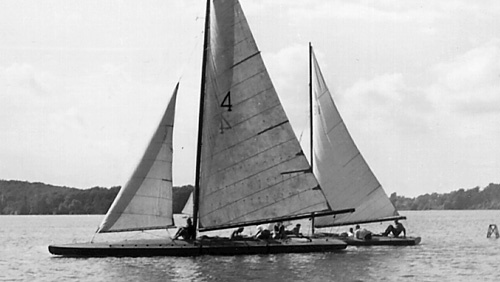 One-design sailboat racing was just starting at the turn of the century. The inland scow had already established itself in the Minnesota, Wisconsin, and Iowa lakes, beginning with the giant A (see photo below) and the now extinct B, as one of the fastest and most challenging of all racing concepts.The more affordable and manageable C (bottom photo) appeared in 1906 and quickly dominated scow sailing on the inland lakes. 1923 brought the 28 foot E design, presumably as a "poor man's A" that could be sailed with a crew of only 3 or 4 instead of 5, 6 or 7. After WW-II Harry Sr.and Buddy Melges gave us the M, MC,and M-20 designs. The early scows were gaff rigged. Fraser Scholes recalls some of the last gaff rigs on Twin Lakes in the 30's. They all had wood hulls, the spruce planking stained and varnished a soft yellowish tone, painted canvas covered decks, and wood spars. The cotton canvas sails were cut in narrow panels. When they got wet it wasn't so easy to bring the boat up. There was a handrail about 3 feet long called the "monkey rail" outboard on the port and starboard decks. The windward board would be left out so that on each windy tack the crew, one, two or even three, would scramble out on the board and hang onto the monkey rail. In those days hiking was really hiking. Apparently sometime in 1939 some spirited discussions as to relative boat speed and sailing skills gave birth to the Twin Lakes Yacht Club. 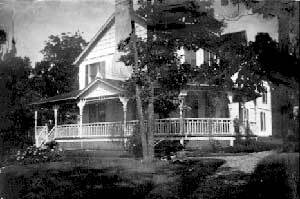 The club was formed on the 20th of August, 1939, with 31 members from both Lake Mary and Lake Elizabeth. To start with only 5 were active sailors, with the balance consisting of associate and charter members. To become a member, one had to file a formal application with the board of directors,and then be voted on by ballot. The minimum age was 16 years. Dues were $1.00. The racing season was from July fourth until Labor Day and standings were based on the point system. Open club meetings were held on the 2nd and 4th Sunday of every month, and social events were held on the 1st and 3rd. Races were held on whichever lake had the most boats in that class so the boats had to be de-rigged, hauled out on big four wheel trailers and launched in the designated lake and re-rigged. If you were the lucky one to win a trophy for that year, it was then your responsibility to replace it with a similar one for the next year's winner, as club funds were extremely low.